Wow...two weeks from this moment, I'll be wedged into a coach seat on a plane...heading to Rome. 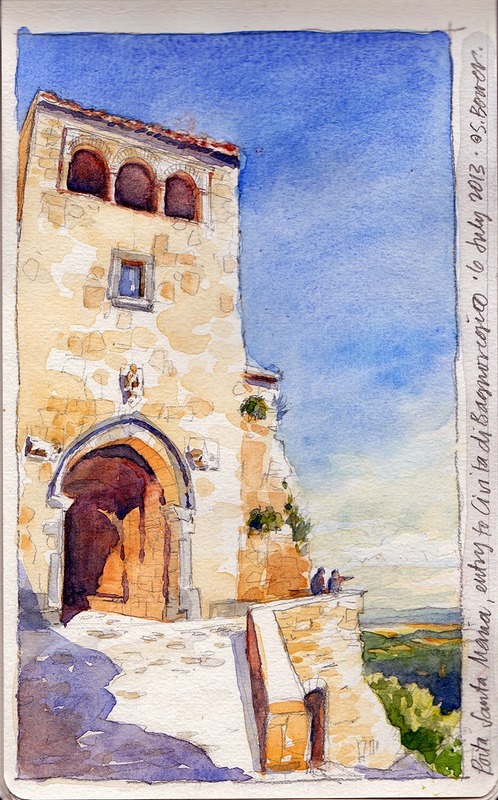 With the Civita Institute's Astra Zarina fellowship, I'll be spending 2 months in the teeny Etruscan/Roman/Medieval/Renaissance (and it pretty much stops there) hill town of Civita di Bagnoregio ITALY, literally following the footsteps of other Seattle sketchers like Anita Lehmann and Dave Boyd who were there last summer. The project: to create an illustrated walking guide to the town, as tons of tourists show up and quickly walk from one end to the other, never knowing that they are in a really amazing, historic place. Then in late August, I'll board a plane again to join the Urban Sketchers community at the symposium in Brazil to teach a workshop called "180 Degrees", which will include lots of how-to information on basic perspective. I love these wide angle views, as they really put you in the space! And if Paraty is anything like Barcelona last year, it will be amazing--so very, very well organized, an incredibly fun opportunity for any and all sketchers. It appears that lightening can strike the same place twice, I am so very, very grateful for these utterly amazing opportunities and adventures. My gosh, it honestly seems too good to be true. like an island high above the valley below. Stephanie-Hesse are great! Looking forward to your posts from Italy. I will be going there summer 2015 and haven't decided yet which cities to visit so would love to see your illustrated walking guide. Will it be done by then? What an exciting project! Hi Jackie, thanks so much for your message! Civita is an extraordinary place, rather off the beaten path north of Rome and south of Orvieto. Yes, the walking guide should be done by next year for sure! It will be great to really learn about the place and create this guide, I hope you will get to go there next year! The Civita Institute facilities are just beautiful, and anyone can stay there...maybe add it to your list of possibilities! Grazie, ciao!